BGP Local-Preference Attribute Cisco is another BGP attribute that’s important in the decision process for multiple redundant paths. In fact, if you’re concerned about the order of things, you should know that on Cisco routers, the “weight” attribute is checked first, so that if a given neighbor has a higher weight, the local preference isn’t even checked. However, it’s still quite important because it is an important attribute on all routers, and it affects the BGP routing process in much the same way. Local Preference is one of the ways to alter the path taken by one AS to reach another AS. The difference between Local Preference and Weight is that Weight is just locally significant in the router while Local Preference is what I call “Local AS significant”. What I mean by that is that Local Preference is being propagated Intra AS but not outside the AS. Local preference is to influence your own AS how to get or exit to another AS. The higher the local preference, the more preferred. 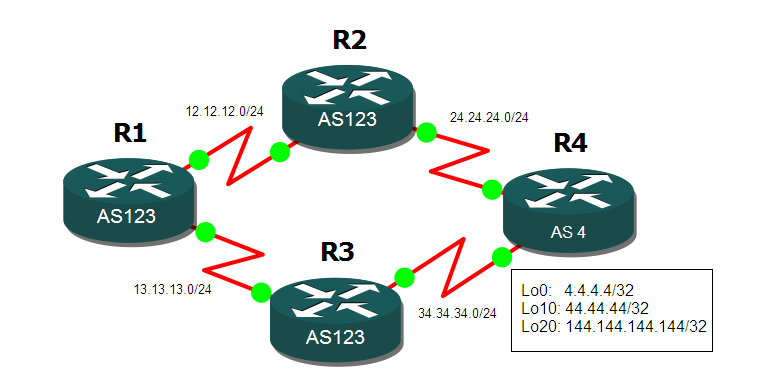 In this lab, local preference will be configured and will be using route map for more flexibility. Check the diagram below for details. route-map that will assign a local preference of 500 in R2 for the network 144.144.144.144/32. Here are the initial BGP configurations on the routers. Let’s see what is the best path taken by R1 to reach the networks advertised by R4. Immediately, even without clearing the BGP process, R3 now became the more preferred path to reach R4. Remember that in Local Preference, the higher the value, the more preferred. 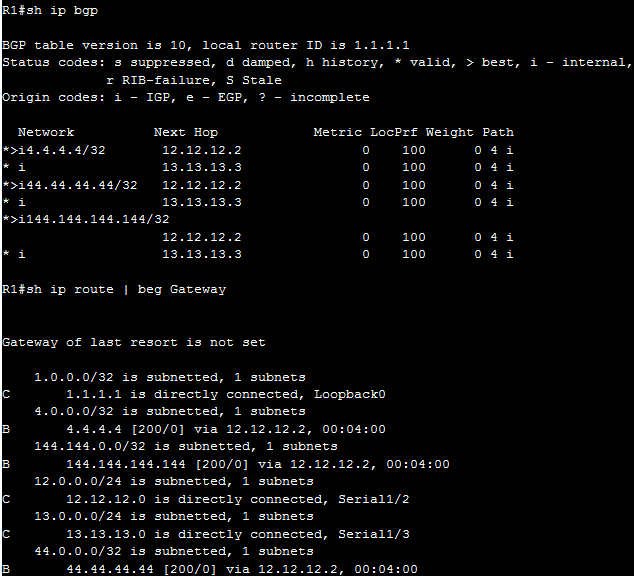 Let’s configure in R2 a route-map so the network 144.144.144.144/32 will have a local preference of 500. This will make R2 the best path to reach the mentioned network. Firstly, why is that the route-map has an “in” direction. It’s because we are receiving the route from another router, R2 is not the one advertising. You can see now that path to 144.144.144.144/32 will have R2 as the next hop. If you noticed also, why is that for 4.4.4.4/32 and 44.44.44.44/32, there is no other path except through 13.13.13.3. Check the route-map above and you’ll find the answer. There is no succeeding line after line 10, which means, it will block out the subnets and not advertised it to R1. Let’s configure the 20th sequence of the route-map. Let’s see now if there are changes.